It’s been a while since I’ve posted here. Money has been tight, and I have been eating at home a lot. However, there is always room for ice cream. I’ve spent the summer exploring some of Cleveland’s oldest and most popular ice cream establishments. I was on a mission to find old-fashioned ice cream stands. It all started out with a stop at Strickland’s of Streetsboro on Route 14 about a mile from the intersection with Route 43. I ordered their Banana Bowl ($4.25 including tip), which features one scoop of vanilla custard, 1/2 a banana, one topping (I chose butterscotch), peanuts and a cherry. T he flavor combination was awesome, and I decided I needed many butterscotch sundaes in my life this summer. Unfortunately I have never managed to scrape up the nerve to ask them to add a banana to the butterscotch sundaes. 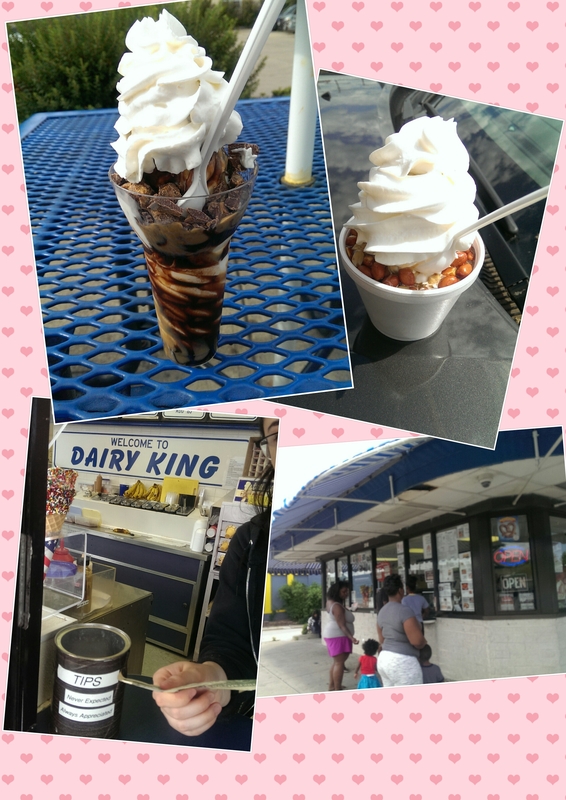 My next stop was Dairy King on Mayfield Road in South Euclid. I’m not sure if it is associated with the Dairy King in North Olmsted I used to visit as a high schooler, but it is awesome no matter what. I ordered a medium butterscotch sundae for $2.75 and got a large because she “accidentally made a large.” It was huge, and I couldn’t finish it. But I kept coming back all summer. 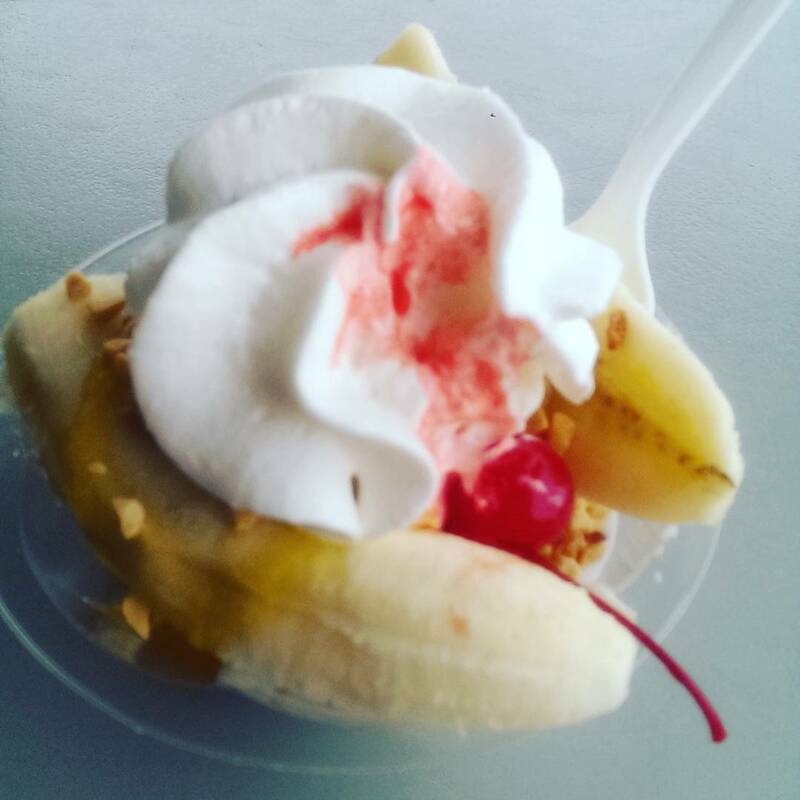 I also really like their peanut butter cup parfait ($4.75) – and where else can you buy a “mini” banana split for $1.35? They also sell hot dogs and fries. Sandy’s Frozen Whip on Lake Shore Boulevard in Euclid also managed to get on my radar. I made a special trip there, and since I was craving a root beer float that is what I ordered. A root beer float and a foot-long chili dog with everything definitely brightened my day. The person working the counter (I think it might have been Sandy herself) was extremely friendly and helpful. She made a strawberry shortcake sundae while I was waiting for my chili dog that looked tempting for next time (sub ice cream for whipped cream on top). 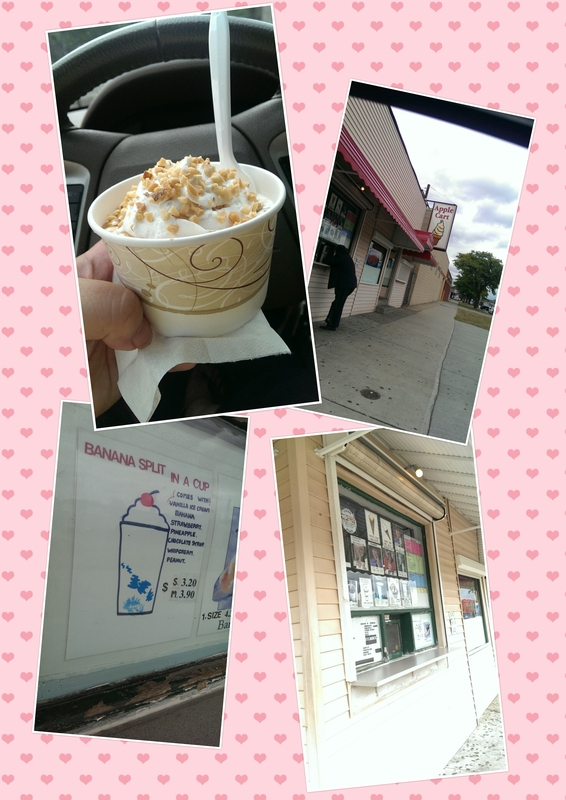 I then went to the Apple Cart, one of Cleveland’s oldest ice cream stands on Superior Road. I ordered a butterscotch sundae for $2.50 (keep the change). The woman behind the counter asked if I wanted whipped cream and nuts – of course. It definitely hit the spot. I had to chuckle driving home and seeing all the workers walking back to work with their ice cream cones. I’m going back soon for a cherry-dipped cone. 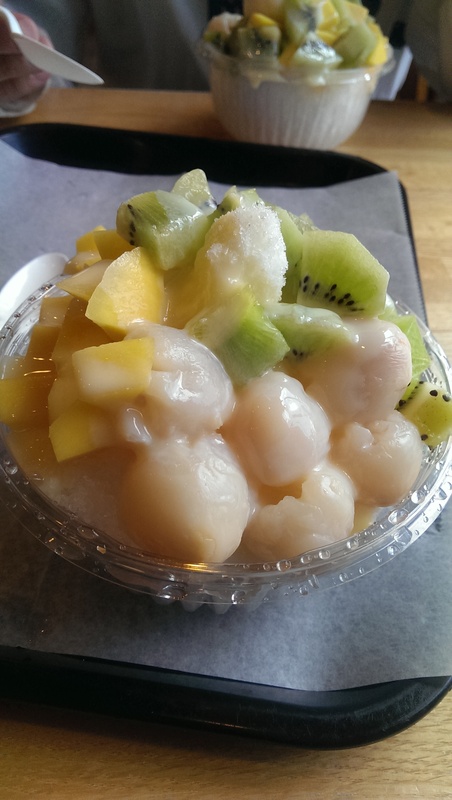 Two outliers I wanted to talk about are Snow Brothers Shavery and Koko Bakery’s shaved ice. They aren’t ice cream per se, but they are a cold treat on a hot day. Snow Brothers is a food truck that you can find at Night Market and various other festivals around the area. They shave their flavored ice to make “snow” and top it with condensed milk and various toppings. 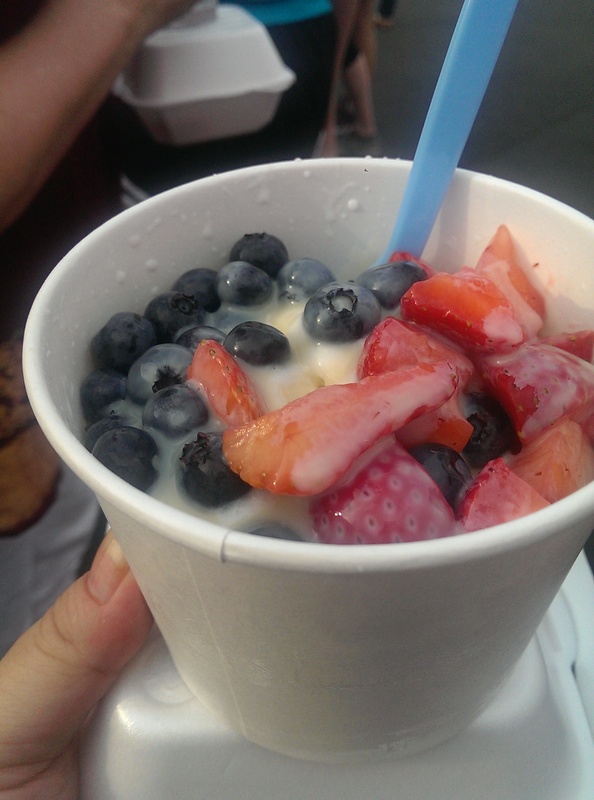 I chose the milk-flavored snow and topped it with blueberries and strawberries, but you can also choose mochi, red bean paste, Captain Crunch and a few other toppings. Koko Bakery also sells shaved ice. They sell Korean and Taiwanese shaved ice. I prefer the Taiwanese shaved ice. The price includes 3 toppings of your choice, and you can add additional toppings for an additional $0.90. I am a creature of habit and always choose lychee, kiwi and mango. And of course no Cleveland ice cream post is complete without mention of Mitchell’s. Mitchell’s fresh strawberry ice cream was a divine pleasure when the strawberries were in season. I hear fresh peach ice cream is in season right now. 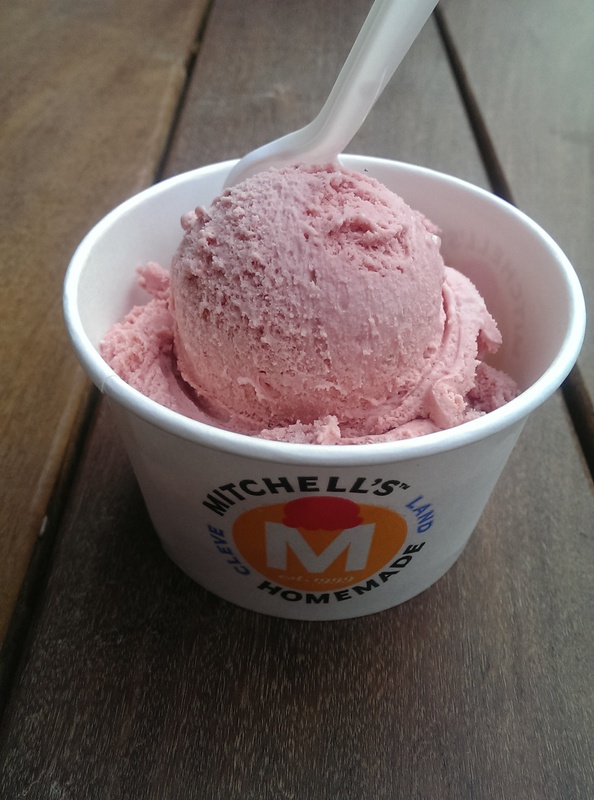 Mitchell’s is always a treat, but this scoop of strawberry really stands out in my memory this summer. They unveiled a few flavors for the RNC and Cavs championship win. You’ve got to love a hometown favorite that is just as passionate about their hometown as well. What’s your favorite old-fashioned local ice cream stand?